Most existing collaborative tools assume that partners share the same perspective on the entities they are working on and therefore these solutions cannot be applied directly to the types of cases this chapter addresses. By exploring geophysics and its peculiarities, one understands its inner dynamics, so that possible solutions can be proposed. These rely on the creation of “boundary objects” capable of bridging different cognitive models. These solutions are based on the integration of diagrams, where concepts and their relations are expressed at an optimal granularity and shared spaces where information can be made available to all partners. These ideas have been implemented in a Web-based Computer-Supported Collaborative Research (CSCR) system that is currently successfully used within many international research projects in this disciplinary field. 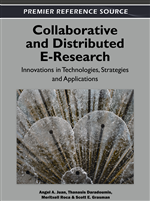 Scientific research covers a wide area of human activities that span several fields and that, following the introduction of Information Technologies (IT) and Internet, are moving radically towards e-research: a perspective where the life of researchers will be augmented through on-line interaction, communities, and knowledge. The exciting opportunities that this moment offers also entail the risk that if these changes are driven only by technology, the real needs of scientific research could be overlooked. It is, therefore, very important to consider first the needs, and only then devise the technology that could support them (Beyer & Holtzblatt, 1998). The traditional view states that scientific research in all disciplines should be built upon the common perspective of the scientific method, which in the perspective of e-research and Computer-Supported Collaborative Research (CSCR) would reflect in the possibility of following a common approach. We claim that this is not the case, since the existence of a single scientific method is only a myth (Galison & Stump, 1996; Feyerabend, 1975; Latour & Woolgar 1979), as scientific disciplines have rather different approaches and peculiarities that make them diverge from a common perspective. This is particularly true in the case where a discipline studies complex systems where experiments are reproducible only with difficulty, and where, therefore, the hinge of the scientific method itself can be questionable. Symptoms are subjective, so that more than observations or measurements can be considered signs, and signs need to be interpreted through reference to an explanation, a theory, a vision. This duality, clue/interpretation, is typical of these scientific domains so that even Leibnitz, in his time, referring to medicine, highlighted the fact that the discipline is based on a “Duplex methodus tractandi morbos: una Analytica per symptomata, altera Syntetica per causas” (Pasini, 1997). Modern epistemology teaches us that visions bias clues, so that researchers can become detached from facts, which leads them to becoming isolated in communities that speciate and diverge even within the same disciplinary field. In addition, scientific research is increasingly multi-disciplinary, so that the same issue is studied from different perspectives and by researchers with different backgrounds. Coupling distant visions and disciplinary backgrounds with difficulties to refer to solid facts creates a complicated situation that needs to be carefully considered in the perspective of collaborative e-research. In this area, there is a rather long-standing tradition and a vast amount of literature in many disciplinary fields that span from physical sciences to health or environmental research (see for example Olson, et al., 2008, for a large collection of case studies). These studies are generally more focused on large scientific instruments and resource sharing e-science, for example Olson et al. (2008) show that physical sciences are fundamentally “physical” so that, researchers, there, are mainly aiming at making expensive devices available widely and remotely. In other fields, the goal is to link together resources creating powerful computing environments (Foster & Kesselman 1998), see for example Dove and de Leeuw (2005) for molecular simulation. However, not so much research has been done in distributed scientific collaboration directly between peers in communities (Farooq, et al., 2007) and, in particular, in shared spaces characterized by the risk of cognitive model incompatibility.